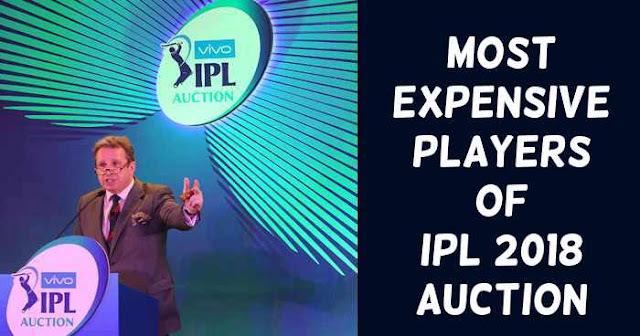 Auction for the 11th season of Indian Premier League (IPL 2018 Auction) took place on 27 and 28 January in Bengaluru. Once again as IPL 2017 Auction England All-Rounder Ben Stokes is the most expensive player at IPL 2018 Auction Rs 12.5 Crores; Rs 2 Crores lower at than what was paid in IPL 20117. Ben Stokes was bought by Rajasthan Royals. Jaydev Unadkat was the most expensive players Indian players bought by Rajasthan Royals at Rs 11.5 crores which was followed by Manish Pandey bought by Sunrisers Hyderabad and KL Rahul bought by Kings XI Punjab at Rs 11 Crores each. Krunal Pandya was the most expensive uncapped player, which was bought by Mumbai Indians for the whopping price of Rs 8.8 crores.